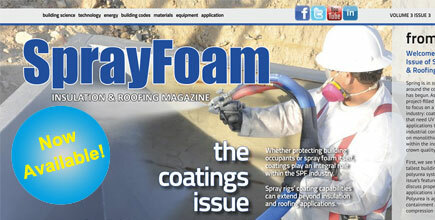 JUPITER, FL–May 2, 2013–With its third publication of 2013, Spray Foam Insulation & Roofing Magazine (SFIRM) brings readers The Coatings Issue. SFIRM’s May/June 2013 edition is currently live on the magazine’s globally accessible web and mobile app platforms. In addition to coatings-centric articles, the May/June 2013 also features established spray foam departments like SPF equipment and roofing.